In "Discounting a Meal for ‘Well-Behaved Kids’" KJ Dell'Antonia asks "Would a universal “well-behaved kid” discount encourage more parents to properly train their little terrors...?" I wish we had restaurants doing this when our kids were young. I frequently recall ensuring our little ones behaved themselves when we went out to eat, and I insisted that we not respond to every attempt to misbehave by offering them a distraction, be it a toy , or a video, as that would seem to defeat the purpose. Enforcing this behavior became significantly more difficult when we went out to eat with friends who thought it was acceptable to allow their kids to make a mess of the condiments, play under the table and even run around the restaurant. That was one of our earliest opportunities to tell our children that "it doesn't matter what they're doing. We're your parents, not theirs, and its our job to teach you how to behave appropriately." This would be a conversation we would have with them many times, and we still do, but I'm glad we started early as I believe it gave them a head start developing the coping skills that all parents should eventually expect from their children. The author goes on to point out that "the vast majority of parents we see daily are really doing the best they can." While I'm sure that is the case for many parents, I also know there are many parents who don't see the need to enforce such behavior, and some parents are just lazy. As far whether or, not we should discount receipts for well behaved kids nationwide, I don't know, and I don't care, but I'll say this: anytime I see this type of discount on my bill, it will get redirected right back to the tip. 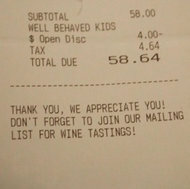 i would like to see a well behaved adult discount. i would REALLY like to see people not stiff the waitstaff because they are having a bad day. when the kids were younger, if we kept them engaged in the conversation, treated them like people, they were fine. our adults friends who ignored or patronized them always seemed to end up covered in spaghetti. Did you hear about Pastor Bell (http://t.co/TumV3tSb) and Applebee's Social Media Meltdown (http://t.co/lvcr2KTZ)?